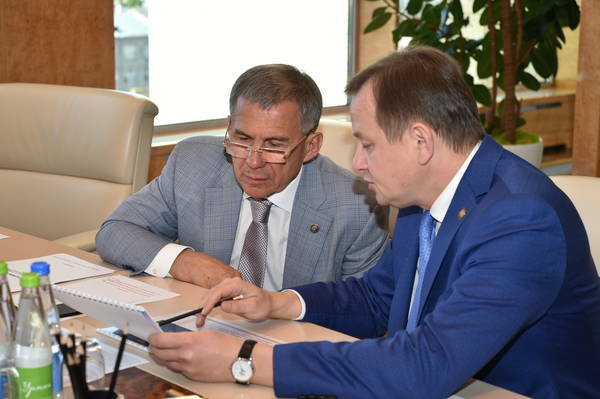 On 29 June 2017, the President of Tatarstan, Rustam Minnikhanov, together with the Minister of Health, Adel Vafin, approved the launch of a national Portavita programme. Tatarstan, an independent Russian republic with a population of 4 million, will start the programme using the Anticoagulation and Cardiovascular Risk Management (CVRM) modules as well as Portavita Analytics for the analysis of the patient data. The President and Minister attach a great deal of value to the 15 years of experience acquired by Portavita in the field of anticoagulation and to the experience built up in the Netherlands, where anticoagulation care has been at a very high level for 40 years now. bring the treatment closer to the patient. At present, almost all patients need to pay a visit to the hospital for a relatively simple procedure. The anticoagulation module makes it possible for patients to take blood samples themselves and to enter the results into the system or at a local facility, after which the required dosage recommendations are formulated at the expertise centre. gain insight into patients with an increased risk of complications, at the local, regional, and national level, via the Cardiovascular Risk Management file. The Ministry of Health aims to reduce the number of thromboembolic complications by 11%, the number of bleedings by 22%, and mortality by 11%. An additional goal is to implement a prevention programme with regard to cardiovascular complications. This programme is expected to result in a 15% decrease in the number of hospital visits, a 30% decrease in the number of hospital admissions, and a 5% to 7% reduction in mortality. A visit paid by Dutch Minister of Health, Welfare and Sport, Edith Schippers, to Russia in 2013 and the efforts of the Task Force Health Care gave the President of Tatarstan greater insight into the leading position played by Dutch healthcare institutions in several areas. The initial contacts for the above activities were established during a return visit to the Netherlands, which included a delegation from Tatarstan led by Minister of Health Vafin. Portavita will set up an organisation in Tatarstan in partnership with government entities and private companies. The goal is to roll out solutions not only in Tatarstan but also in other parts of Russia. In addition, an IT development organisation will be established at the Innopolis high-tech centre, in collaboration with Dutch IT organisations, which will help organise the further roll-out of the Portavita Health Management Platform.